This past weekend I installed the zipper and completed the fly portion of my jeans. At the rate I’m going, I will be lucky to complete this “muslin” by the end of the month for the PatternReview jeans contest. I certainly won’t have the sangria pair done by then. Currently, my professional life has entered a state of upheaval, so it’s put a damper on the amount of time I can devote to this project. Nevertheless, the contest did get me started on this project, and I will finish it. I’m looking forward to the result. The notes I provided below aren’t strictly in the order I followed them, so apologies for any confusion. The MPB sewalong makes the ordering pretty clear. With my Crayola washable marker, I drew a line up the center front. The pattern instructions have you run a basting stitch up that center line, from below the zipper (at the dot) up to the waist. 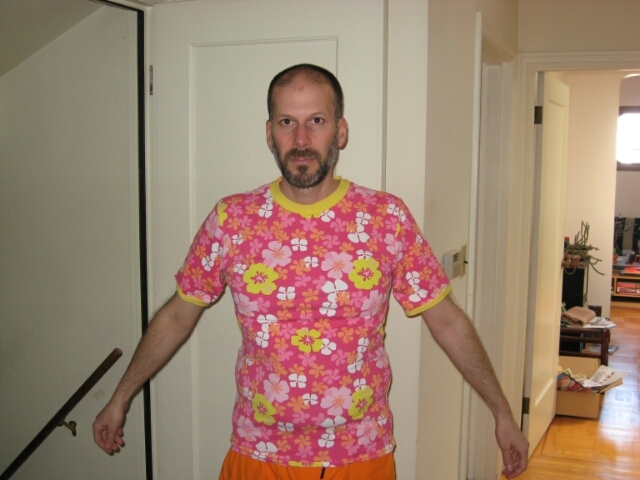 This entry was posted in Fabrics, Trousers, Wovens and tagged Jeans on June 27, 2013 by mportuesisf. Time to sew the front pockets of my stretch denim jeans muslin. I decided to use my serger to finish the seams that aren’t enclosed or flat-felled. This is primarily the outside seam of the jeans, as well as the pocket bags and fly shield pieces. I knew the serger was due for cleaning and oiling, and I’m extremely glad I took the time to do it. As I was vaccuming out the lint from the serger, I found a sewing pin in the feed mechanism. It was a basting pin left over from my last T-shirt project. This could have seriously damaged the serger if I had not discovered it first. The accepted wisdom is that pins and a serger are a bad combination, and I definitely have learned my lesson. 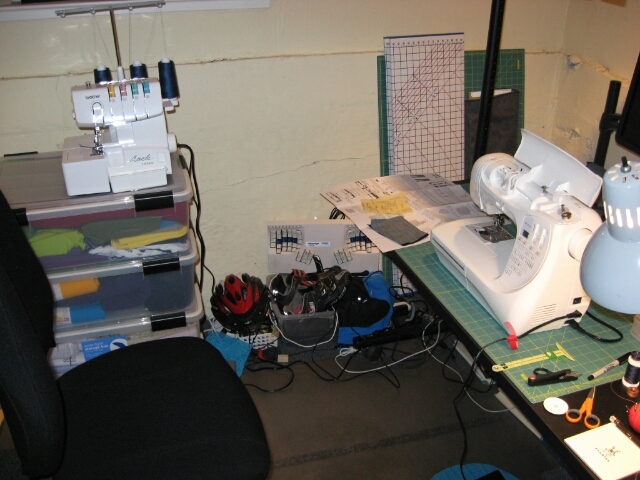 I have the sewing machine and the serger arranged in a “Dual-barrel” setup. This entry was posted in Fabrics, Trousers, Wovens and tagged Jeans on June 23, 2013 by mportuesisf. 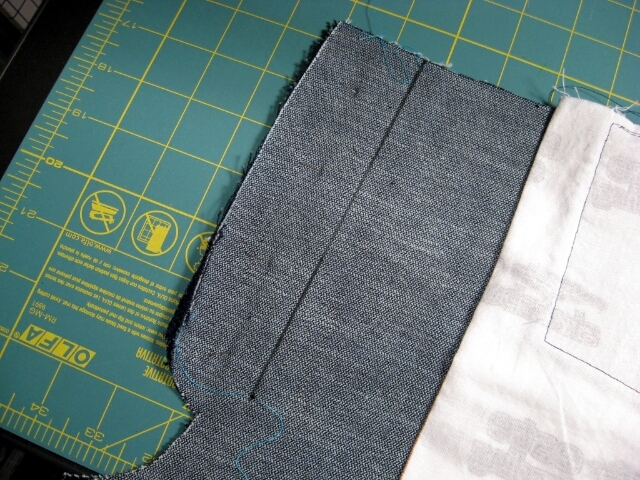 Before I started sewing my jeans together, the MPB Jeans Sew-Along suggested to test needles, thread and fabric first. Especially since I am using some heavy fabric, and heavy topstitching thread. Before I began test stitching, I consulted my sewing library for advice. Both the Reader’s Digest Guide to Sewing and DK’s The Sewing Book were silent on the matter of thread tension. I did find some help on adjusting tension in Nancy Zieman’s Sewing A to Z, and in my sewing machine’s instruction manual. So if you need to learn more about thread tension, your machine’s instruction manual would be a great place to start. This entry was posted in Fabrics, Sewing Machines, Trousers, Wovens and tagged Jeans on June 23, 2013 by mportuesisf. My work on the Sangria Jeans for the PatternReview contest begins. Originally, I intended for the Sangria bull denim to be just for a muslin, because the color is so strong. But now it’s going towards making an actual, wearable pair of jeans. And I just found a matching colored jeans zipper at JoAnn’s last night. 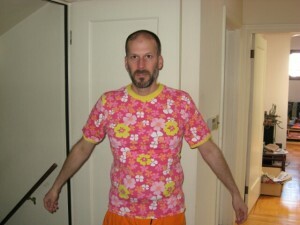 I do have a floral nylon/lycra Hawaiian T-shirt I sewed, which will go very well with the Sangria fabric. This entry was posted in Project Planning, Trousers, Wovens and tagged Jeans on June 15, 2013 by mportuesisf.